The driver of the car, Sudapon Nontawat, made the U-turn near the entrance to Land & Houses Park Phuket on Chao Fa West Rd at 11:30pm. Sudapon was taken to hospital after the accident, but was discharged last week and presented herself at Chalong Police Station on Sunday (Dec 9), Lt Col Thada Sodarak, the investigating officer from the Chalong Police, explained to The Phuket News. “Sudapon confessed that she drove carelessly and crashed with the two tourists on the motorbike,” Col Thada said today (Dec 11). However, Col Thada added that no preliminary charges have been pressed against Sudapon. “Even though she confessed, we must still conclude the investigation and hand the case to the public prosecutor for further action,” he explained. Col Thada added that the case should be simple. “Police have CCTV video footage of the accident,” he said. Chalong Police Chief Col Pakkayot Tanongsak told The Phuket News on Friday (Dec 7) that police had Sudapon tested for alcohol and drugs after the accident, but that officers had yet to receive the results of the tests. 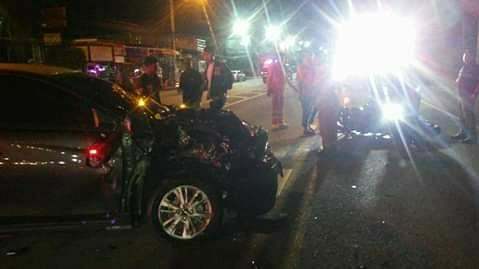 Col Pakkayot dismissed the importance of the Phuket-registered Toyota Camry that Sudapon was driving still bearing red 'dealership' licence plates at the time of the accident. Under Thai law it is illegal drive a vehicle with such licences plates after dark or out of the province. “This is not a major factor. She will be fined for driving a vehicle with this kind of plate at night too, but the main charge is reckless driving. Police will charge her with reckless driving causing death,” Col Pakkayot said. P44 should write a book:  "Why I hate Thailand, but still choose to live here". It would sell at least 3 copies to other like minded people who comment on these pages. Gee, the woman has confessed to driving carelessly. They have CCTV of the incident. I wonder what else they have to do to conclude the investigation? Why does it sometimes take so long to get drug and alcohol results? Like the guy driving the black mercedes. Long delay in release of results. Still can't believe he was 100% sobre. Did you ask her how she feels now? I think we all knew who was at fault knowing how Thai's drive except for the usual band of delusional apologists, lets swap the roles and see what would happen if a tourist killed 2 Thai's in this manner, identity exposed, guilty until proved otherwise, charged immediately, extortion, they would be in a world of trouble, gaping double standards in xenophobic Thailand. If people do not comment on illegal things, nothing will happen. Here's an example of red signs on the car some driving after dark.so now ws waiting what happend whit this old man some make a very bad accident about 200 meter from this accident fore 12 week ago. So to PN please hold the press up on this cases. Money makes them alive?? Young Girl makes one big mistake that kost two lives. Did you ask her how she is feeling about that?? And do you know about Bikers used helmets?? i hope you never come in some bad situation triggert by you. No money in pursuing the woman since shr probably hasn't got much money. And, heck, it was only tourists. No problem.